Thread in 'Hardware' started by prvskfg, 10 Feb 2017. First of all sorry if i'm not writing in english properly, i'm a TGM player from Argentina like Nahu. Second: i started playing TGM1, TAP and Ti with keyboard (since i'm wasn't used to "arcade sticks" but i love them !) so i thought about building one myself. I did it but it has an Italian stick (it's a shame that you can't change it to 4way so i left that) and if you are going to ask for a sanwa stick, you will regret searching a sanwa stick in Argentina but at least there are some Zippy (i'm going to buy it and replace that italian stick, it's not a sanwa but at least it has 4way restrictor). Let's say at this point i finished my stick but now this is my question. I was thinking about buying TGM1 pcb or TAP pcb but i need some help since i don't find any website where i could ship it. So, someone could help me with that? (Once i have a solution for this, it's obvious that i'll ask some more things). I thought playing Ti with my stick but should i set up something so i could run the .exe fine? If i can't ship it should i stick with TGM1-TAP with MAMETGM because i know that some will say "Play nullpomino" but i like the interface of TGM and TAP. For the PCBs, sometimes people sell them here. You have also a few Japanese websites that have TGM PCBs in stocks sometimes (it's very expensive though), example: https://www.tops-game.jp/ (they ship worldwide normally). An additional option is Yahoo Auctions (it's the Japanese eBay), but you'll need a proxy to buy from it as most of the sellers won't sell abroad and the website is 100% in Japanese only. You can expect at least 300-400 USD for TGM1, 700+ for TAP (the only way to find it cheaper is here on this forum) and 1000+ for TI. To play the games you'll need a supergun (it's a device which is between your game PCB and your TV, sticks, PSU, ...) and a CRT which accepts analog RGB video signals. This is for TGM1 and TAP. TI is a whole different beast as built around Taito Type-X (some kind of PC architecture) with hard drives, USB dongles that like to fail and other fun stuff like JVS IO. I won't criticize your stick as after building my own I still tend to play a lot on my keyboard, but I guess you could find it outside of Argentina ? I've never searched for it but I'm sure you have arcade supply shops that sell worldwide. A Sanwa joysticks costs around 20 EUR and buttons 2~3 EUR each here in France, might be costlier in your case. TGM1 and TAP are fine in mame. 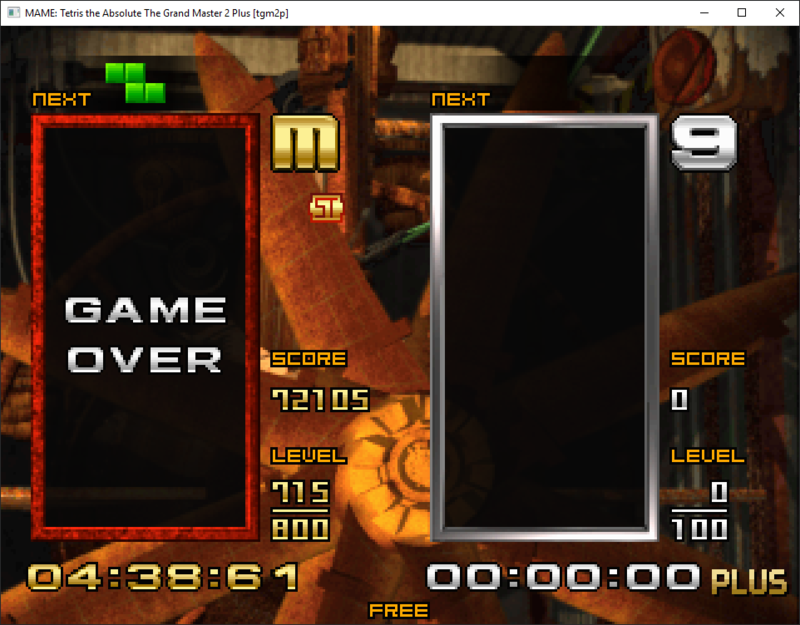 In fact, probably even TAP moreso than TGM1, since the hardware it's running on is simpler. As for Sanwa sticks - Apart from being able to set your joystick to 4-way, you should really just go for what feels good. For TAP Master though, I think a standard Sanwa is absolutely an advantage. For TGM1 or 20G gameplay it's not as tight, as you never need to press up. I'm sure you could find an American webshop selling Sanwa sticks that will ship to Argentina though? Or maybe even a South American one, I've seen a LOT of south american arcade gamers around the internet, so surely there's a market for them. Sanwa isn't really any more expensive than other brands when going for a lose stick, and they aren't rare either, so if you CAN get it, get it. For TGM1 or 20G gameplay it's not as tight, as you never need to press up. How do you play TGM1 Rev Mode without pressing up?? In all seriousness, good advice given here. I just wanted to add that when it comes to 4-way restrictors, if you don't have a Sanwa JLF make sure your restrictor is diamond shape. Seimitsu sticks have a clover shaped restrictor which makes things like Zangi moves for TAP and TI difficult and awkward. Yesterday i saw a similar post and Kevin answered with a website "Sophia" which has TGM boards, so i mailed them asking for prices and everything. If i want to buy a PCB i don't have any choice so if it cost like 600 dollars well, i will have to wait and buy it. For the Supergun and the CRT it won't be hard to get them because it's not as rare as TGM PCBs in America from my point of view. Even here sell supergun and the CRT are common, unless if someone wants a specific one. For the Stick that's easy because i'm trying to find a solution with every part, i thought about buying a Sanwa Stick but it's like 100 dollars here and i'm not kidding.. So if i want a sanwa stick i will order it from outside with other orders (like the PCB or else). I realized after using MAMETGM that TAP runs more smoothly than TGM1 so, if i'm going to stick with MAME i will play TAP. Tomorrow or on monday i will buy a ZIPPYY stick, like i said before at least it has 4way restrictor. Ah, a third Argentinian shows up! Glad to see me and nahu aren't the only ones! Sadly, I only use keyboard because arcade sticks are expensive and troublesome for me right now. Given our country's economic decisions and trading policies, opportunities for legit hardware and software (the games themselves and the sticks and anything else) are scarce and costly. We don't have easy access to all this stuff, at least not as much as those in the US do. It contains everything you'd need for a stick (and maybe more, if you only need 6 buttons). Oh yeah, also ordered from this guy once, but only the USB Encoders. They worked fine for what i was trying to do (wiring old arcade controls to a Raspberry PI). honestly the most important thing in the stick is a proper diamond restrictor plate for good action. then you will need to file the edges off to diamondize it. I don't know, I've played reasonably well on other clover restrictors (i.e., Seimitsu LS-32). It is sort of an awkward feeling though. It'll wear down naturally over a long period of heavy play. However, if you want to skip ahead as Zaphod suggested, I did see that someone on another forum used a soldering iron to burn away the nubs of the clover and diamondize it that way. I've worn a clover gate naturally. Takes 100s of hours. I wouldn't recommend a soldering iron though, I would just file it gently.